Enjoy the top 61 famous quotes, sayings and quotations by Astra Taylor. Those who applaud social production and networked amateurism, the colorful cacophony that is the Internet, and the creative capacities of everyday people to produce entertaining and enlightening things online, are right to marvel. There is amazing inventiveness, boundless talent and ability, and overwhelming generosity on display. Where they go wrong is thinking that the Internet is an egalitarian, let alone revolutionary, platform for our self-expression and development, that being able to shout into the digital torrent is adequate for democracy. I work for free all the time, as a writer but also as an activist. The decisions we have to make as individuals are really fraught but also can be really wonderful and we're all navigating this reality to the best of our abilities. But, again, I wanted to take a step back and look at the broader context. First we need to rethink the terms and recognize that we've imported this language from the technocratic class, from Silicon Valley, that talks about openness and transparency. One consequence of this is that people are expected to make it on their own by chasing clicks or building a brand. What a diminished vision that is. One of the big myths about people growing up is that they are "digital natives;" that just because they've been raised with the Internet - that you're very adept at using the app on your phone - it doesn't mean you have any idea about how the Internet actually works. One sad consequence of this is that people don't feel permitted to try understand Internet infrastructure, so I'm really grateful to groups like Free Press and other nonprofits who are trying to make the issue urgent and comprehensible. And Andre Blum's book Tubes is great on this topic. There's this divergence out there between the very small and the very large with the middle disappearing. There is something paradoxical going on where there is this access and we can seek out things on the fringes, but that doesn't describe the overall reality, because the big are bigger than ever. A big factor is that the enthusiast camp's values are really rooted in Silicon Valley and in these supposedly new business models. But again, I think this such an interesting moment because things like the NSA revelations are really forcing people to recognize the connections between corporate and government surveillance. I'd go to conference after conference and it would essentially be the talking points. Either pro or con. It's amazing how polarized the tech conversation is. There's also this neurological fixation, the incessant wondering what the Internet's doing to our brain: "Does it make us stupid, does it make us distracted?" And then the other guys say, "No, it's making us smarter than ever, and better than ever, and more connected." And it's like, where is the economic and social context? Why is that rarely considered? Basically political economy - that you have to look at how funding structures shape the media landscape. You have to look at commercial interests, consolidation - the economy structures are experience. I'm interested in the way the whole cultural landscape can shift over time. Okay, this will seem like a silly example, but look at the whole discourse around "selling out," a concept people say is irrelevant because there's no more distinction between mainstream and underground, inside and outside (which I don't really believe, but that's another issue). What we need to do is take that inchoate sense that something isn't right and give it a structural component and the sense that things can be another way. I think that overall, ultimately the impact of advertisers calling the shots is a more cloying, complacent culture. For example, it was just announced that Unilever is branding environmental content at The Guardian. How radical or pointed can that content be? 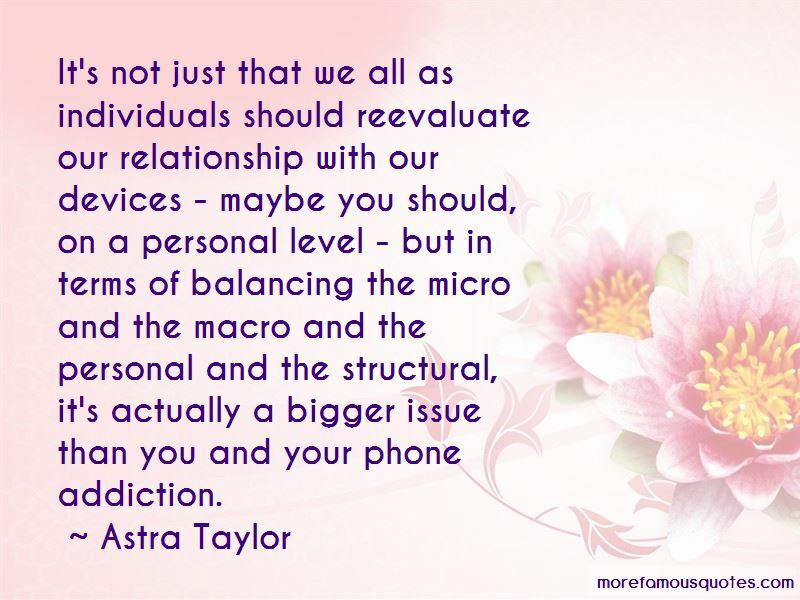 Want to see more pictures of Astra Taylor quotes? 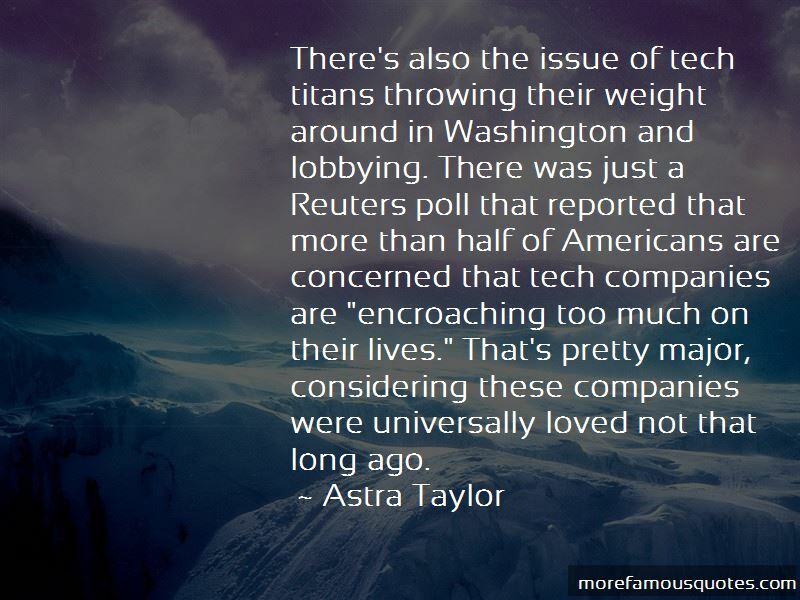 Click on image of Astra Taylor quotes to view full size.